The ELRepo Project has DRBD packages for CentOS-5 and CentOS-6, named drbd83-utils or drbd84-utils. The CentOS Project does not want to maintain extra packages that exist in other places unless we need to change them ... so we are not going to create DRBD packages for CentOS-6. Since CentOS-4 is being EOL'ed in less than a month, we are also not going to publish updates for the DRBD in CentOS-4. This leaves the DRBD for CentOS-5 that are part of CentOS Extras. Since these have been released for CentOS-5, we will continue to maintain the DRBD version 8.3.x tree (drbd83) in CentOS Extras. If you want to use DRBD 8.4.x for CentOS-5, rather than releasing it separately, the CentOS Project recommends that you use drbd84-utils from ELRepo (linked above). For users who want to use the drbd83-8.3.12 version ... please test the version that is currently in CentOS Testing and provide feedback. With enough feedback I will move the packages from testing to CentOS Extras. NOTE: These packages have now been moved to CentOS Extras and can be installed normally with yum. The CentOS Project has spent much time and effort into getting a new build system in place for CentOS 6 that can generate good and timely builds, as well as inform us of newly released upstream SRPMS and keep the CentOS QA team informed when we build any new packages. The release of CentOS-6.2 on 12/20/2011, in less than 2 weeks and at the same time as Oracle's OEL as noted on Distrowatch, is where we would like to have all our future releases be. I think that we should see the standard 2-4 week time frame for point releases and within 24 hours for updates now that we have this new build system in place. The purpose of the CR repository is to allow the CentOS Project to push some of the security updates if we are having issues with a point release build (like we did with both CentOS-6.0 and CentOS-6.1). If we are not going to meet the 2-4 week goal for our point release, we will push out the packages we have gotten to build properly while continuing to work on the problem packages. This repository is totally optional and was not needed with CentOS-6.2, but we recommend it be installed if you want to get your security updates as fast as possible. Karanbir gets the credit for the new build system, called reimzul. It uses beanstalkd work queues and allows adding new builders to process the work as required. The build system has the flexibility to allow us to import SRPMS into a git repo for packages we want to change, generate a new SRPM after edits for those packages, and submit those modified SRPMS into the work queues. It also allows for the submission of non-modified SRPMS directly without the need to import them into git. It automates several things that we have done in the past by hand (automatically knowing which packages are not built by CentOS (for example the RHN packages that deal with upstream subscriptions) and automatically copies multilib 32bit packages into the 64 bit tree. The system also reliably produces the Yum-Presto DeltaRPMS and metadata for minimizing download times for updates. We do need to announce that CentOS-4 will be reaching the End Of Life at the end of February 2012. 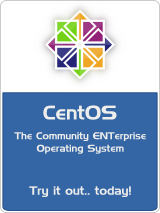 That means that there will be no more CentOS-4 updates after March 1st, 2012. If you are still using CentOS-4, you need to upgrade to CentOS-5 or CentOS-6 or switch to Red Hat's paid Extended Update Support for EL4 to continue to get updates. Please see the CentOS-4 EOL announcement for more details. So, news on the CentOS front for 2012 is very promising and we are looking forward to great things in the new year.